Quo Vadis Coaching and Consulting recognizes that effective leadership is a key driver for achieving organizational effectiveness and leadership coaching can positively contribute to a leader’s impact. Quo Vadis defines leadership coaching as a thought-provoking and creative process that inspires leaders to maximize their personal and professional potential in order to achieve higher performing organizations. We use an integrated coaching model of feedback, support, and challenge to increase the leader’s effectiveness. In other words, we help clients increase their capabilities to do what is required in their position, build stamina and discipline to lead “when the going gets tough,” and build a support system that helps break down the barriers to their life-long development as a leader. Quo Vadis has coached executives and senior leaders living in the US and aboard including high potentials, managers transitioning to higher levels of responsibility and leadership, and senior leadership teams. Quo Vadis Coaching and Consulting collaborates with leaders at all organizational levels to lead change. However, we recognize that a crucial aspect of leading change is transition management….the “getting to where you want to be.” William Bridges (2002) points out that change is external (the different policy, practice, or structure that the leader is trying to bring about), while transition is internal (a psychological reorientation that people have to go through before change can work). Integrating various conceptual models for change, we use a capability building and developmental approach that helps leaders and organizational members implement change while managing transition. 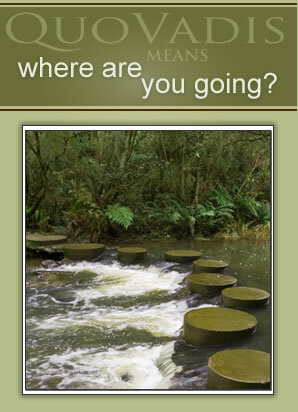 Quo Vadis Coaching and Consulting provides both basic and developmental facilitation for groups. Basic facilitation temporarily uses a facilitator to help the group work together to accomplish its goals. Developmental facilitation uses a facilitator to help the group work together to accomplish its goals as well as enhance each group member’s ability to work more effectively over time. Quo Vadis integrates knowledge of group dynamics, expert facilitation strategies, and meeting design experience to effectively combine different perspectives to solve problems, find solutions, and make good decisions. © 2010 Quo Vadis Coaching and Consulting. All rights reserved.